Do you mean that one that worked harder than anyone else in practice, lifted weights like it was an addiction, and slowly climbed up the depth chart by sacrificing himself on special teams? Yeah, I loved that guy, too. We need more of those. Farmer Jake and DuckTownHusker like this. Discoverer27 and DuckTownHusker like this. Doug Wilkening was my favorite. Just because he was a friend and I knew no one else would mention him. At the time, he was the fastest fullback we had ever had - ran a 4.6 forty. He was the Chevrolet Player of the Game vs OU in 1982 after scoring two touchdowns. He quit prior to his senior year to hang out with his girlfriend, smoke pot, and ride his mountain bike. That was 1983. He missed blocking for a Heisman winner and the rest of the Scoring Explosion in their record-setting year. Such are the decisions we make when we are young. Like many people then, I didn't even know what a mountain bike was. I didn't care for his girlfriend either. Perhaps if he would have played that year, we would have beaten Miami and won the national championship. But likely not. His leaving made way for some walkon named Mark Schellen who did okay. Schellen ran a 4.5 forty. I was always disappointed that he quit. I thought he was outstanding. And I think he was better than Schellen. I remember the story in the OWH; he said that he was fed up with stress and his dad died in middle age of a heart attack (was an engineer with a CO defense contractor) and he decided life was too short. I think he said he was unhappy with the coaches trying other players to try to put pressure on him (and that he felt like he had proven himself) during bowl preparations; so he decided to hang it up. Orduna was the other guy, So you guys are correct. Tailback in the "Veer" ? Orduna and Kinney alternated at I-Back in 1970. Orduna missed the 1969 season (would have been Sr Year) due to a knee injury. Kinney started at IB that year as a true Sophomore and had a great year. Orduna returned in 1970 for senior year and he alternated with Kinney. Orduna also ran a lot of short goal-line plays because of his leaping ability (15 TD vs. 5 for Kinney and Orduna was leading scorer). A sight to behold. He was a very good hurdler, IIRC. Orduna broke a big 67 TD run against USC that gave us the lead. Unfortunately they came back and tied the game. Orduna had 897 yards on 200 carries and Kinney 694 on 159 carries. Kinney a few more receptions (20 vs 11) & receiving yards. Interesting point. In the TO as OC era, we ran out of the I-formation and the spread. The spread had a RB lined up directly behind the QB and two flankers. It looked a bit like what TO ran options out of in the 1990's. Who did they line up at RB and who at flanker? I am thinking they had a FB in the RB position and one of the IB moved to flanker. But I really don't recall. I also don't know that we ran that in 1969; I am pretty sure we ran it in 1970 because I remember Bud Wilkinson explaining our multiple formations on the CU game broadcast ('71 was at home, hence I would have been at the game, not watching it on TV). Another interesting point, Kinney had 590 yards on 191 carries in 1969 as a Sophomore. He had 44 receptions for 455 yards. I always remember him being a good receiver. So in 1970, Kinney and Orduna made a great tag team as Kinney had the same yards on less carries, and combined the two had a whopping 359 carries for over 1,600 yards. Receiving at the position was down slightly. So anyway, looking at 1969. OI wonder if Mike Green may have played IB (I thought he was a FB and he was listed as such). Green and Schneiss as FBs had pretty good rushing and receiving stats. Larry Frost was also listed as a HB, but I am quite sure he was the starting flanker. Ingles and Frost were the leaders in receptions and yards of your WR/Flanker types. Interesting that Brownson and Tagge had good rushing gain yardage (both lost a fair amount on sacks). ya him...and his 3 brothers too. one household. a decade of starting fullbacks. 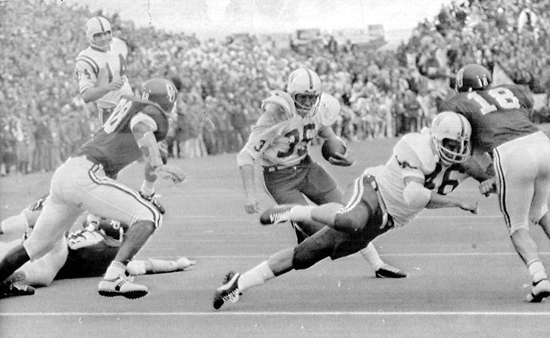 In terms of his overall impact to Husker Nation, the best fullback has gotta be Frankie. Solich earned Ohio all-state, All-America, and all-scholastic honors in high school... scored 104 points but was overlooked due his height (5'7") and weight (153lbs). When he got to his college weigh-in he got his trainer to tape 8 pound weights under his shorts. He now made weight at 162 lbs. He was a part of Bob Devaney’s first recruiting class at Nebraska, and became a standout for the Huskers in the mid-1960s, where he earned the nickname "Fearless Frankie". That description describes more than just fullbacks. But we still need more of those. Odd answer to your own poll. Kinney was listed as a tailback. He originally came to Nebraska as a quarterback, but made some mistakes and they moved him to tailback. To note, Maury Damkroger was the fullback on the '71 team. Here's a photo of him opening a lane for Kinney in the Game of the Century. Yeah, that was at least partly intended. My description pretty much describes every walk-on player who ever started for Osborne, and it seemed like FB and O-line were the places where those guys were most likely to land. So true. Osborne & Co. could get the most out of those players who knew work was needed to improve, and they were willing to do the work with the coaches help. He lined up at FB against Arizona in the Holiday Bowl and then Lee just waltzed into the end zone. For that matter, that was a glorious bowl game. First shutout in Holiday Bowl history and Zona didn't even cross midfield until the second half.